Opened in 1994. Newly renovated in 2007. 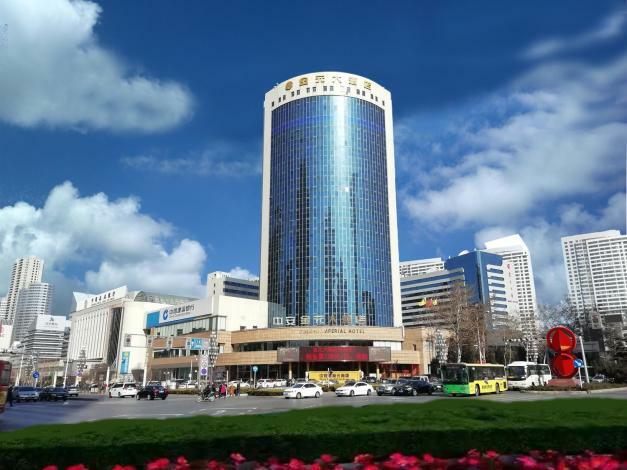 The Jin Yuan Hotel (Dalian Jinyuan Dajiudian) is a business hotel located in the Jinma Road commercial area in Dalian's Economic Development Zone. From the hotel, the airport can be reached with a a 25-minute drive. This Dalian hotel offers various well-appointed rooms and apartments. Chinese, Western, and Japanese cuisines are on the menu in hotel dining outelts. Guests looking for refreshments and lighter far can pay a visit to the lobby bar. Meetings and events can be hosted in the hotel's multifunctional halls, which come in a variety of sizes. There is quite a bit to do around the hotel, sporty activities include swimming, workouts at the fitness center, tennis, squash, table tennis and indoor golf. Guests can also enjoy themselves in KTV rooms, but for something more relaxing, there are massage services and a beauty salon at guests' disposal. - 27km to Dalian Zhoushuizi Airport.